Chabad of the Valley’s “Chanukah at CityWalk” has earned a reputation worldwide as the preeminent Chanukah event on the Jewish music calendar; and this year was no different as families came out in large numbers and flocked to the plaza at Universal Studios CityWalk. A night of Jewish entertainment was featured on the prominent CityWalk stage that often plays host to some of the biggest names in the secular music world. This year opened with Ari Hershoff an upcoming local talent with a big future ahead of him. The evening then went on to feature Kol Esperanza a Jewish pop-opera group currently on tour throughout the United States. Kol Esperanza is led by renowned musical director Tomer Adaddi and has been performing to sell-out crowds across the country. This was followed by Argentenian performer Yehuda Glantz, a veteran of the Jewish music world. The crowd kept building as Yoni Z, one of the most dynamic Jewish music sensations on the world scene today took the stage. 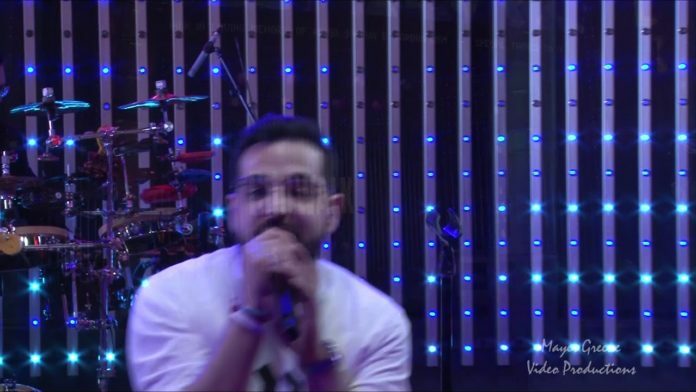 Yoni enthralled participants with one hit after another in his debut performance at CityWalk. Rabbi Mayer Greene, marking his 16th year as the Master of Ceremonies introduced Chabad of Studio City’s, Rabbi Yossi Baitelman, whose foresight and vision conceived bringing such an event into the heart of the Universal Studios. Rabbi Baitelman thanked the Chabad of the Valley team for carrying out this vision. Chanukah at CityWalk is produced by Jonathan Herzog and Rabbi Mayer Greene, along with the event’s behind the scenes technical director, Rabbi Yochanan Baitelman and Rabbi Yanky Kahn, the media liaison. Chabad of the Valley’s Associate Director, Rabbi Mordechai Einbinder addressed participants imploring them to “go home tonight and feel the glow of attachment…kindling your own Menorahs” and then reflected on his esteemed colleague Rabbi Joshua B. Gordon, ob’m, as “one of the greatest Shluchim of the Rebbe, a visionary, a creator… there was none like him”. Following this, a new music video by Benny Friedman was exclusively released for the very first time. The music video titled “Reb Yehoshua Omer” was produced in tribute to Rabbi Gordon and is a follow on from the hit song released last year. Culminating the evening, longtime supporter of Chabad, well known philanthropist Mr. Lyle Weisman was joined by Mr. Daniel Aharonoff, as they kindled the 15ft Menorah situated in the middle of the CityWalk plaza. The star studded event was full of surprises, as video producer and Instagram celebrity Meir Kay took to the stage. Kay rallied up the crowd and let them know he had something special in store for them. Moments later another new music video “Miracle of Light” was broadcast from the big screen, as 8th Day’s Bentzi and Shmuli Marcus burst onto stage to accompany their video in person. 8th day were then joined on stage by Yoni Z and Kol Esperanza for a rocking grand finale including a Hollywood style sound and light spectacular featuring the hit songs Yesh Tikvah and Hashem Melech. Organizers thanked the dedicated staff of Universal for their tremendous efforts to make everything possible and also acknowledged Chabad of Tarzana’s Yochonon Gordon, who arranged logistics for Chabad’s giant Menorah to be on site for the occasion and Shaya Greene, who coordinated the video booth for the giant stadium-sized screen that was a focal point all evening, including a featured presentation of CTeen organized by Rabbi Shua Einbinder, which showcased CTeen’s activities in Southern California and the S. Fernando Valley. Chanukah at CityWalk was once again sponsored by an anonymous donor and in part by corporate sponsorship including: KRLA 870, Milano Collection Premium Wigs, Alacrity Energy LLC, Axis Bridge Marketing, The Jewish Link, Cambridge Farms/Glatt Mart, AAA Rents & Events, Providence, Altria Senior Living, A Coin Exchange, PRAISE Restaurant, Law Offices of Bradley Wallace, Vahdat & Assoc. and Nick Trading International.